Though I may reside in the city, at heart I believe I am a bona fide cottage-goer. I love the planning, the packing, the driving, the arrival, the unpacking, the stay, the clean up, and even the long, weary trip home. I think what does it for me every time is the truly magnificent eats we always manage to have. My parent’s cottage kitchen is about 3 feet wide by 7 feet long – it is an original “galley” kitchen. There are no fancy gadgets and not a heck of a lot of space, but some of my most memorable meals have been prepared in that kitchen. Something special happens to food once it travels north of the city; it takes on a new fascination for me, a whole new meaning and of course an entirely new flavour. Everyone has an undisclosed cottage recipe for something, don’t they? It could be your top-secret recipe for barbecue marinade made with some odd ingredient you can only find in a remote shack-store off of highway 115. It might be your hush-hush procedure for grilled fresh-caught fish that can’t possibly be replicated at home. Or it could be your undisclosed formula for making a perfect pie with the delicious berries you pick yourself at a farm off of a little-traveled stretch of the 118. Whatever it might be for, the recipe is entirely yours and you make it better than anyone else would, did they try. I have always thought a cottage cookbook would be an excellent invention. Perhaps one in which you could add your own recipes, notes and photos! But, now have found the closest thing to it. Marty’s World Famous Cookbook: Secrets from the Muskoka Landmark Cafe is that find. This cookbook has some really fantastic recipes; from his restaurant’s House Bread, to Mario Batali’s Basic Tomato Sauce to his very original Buttertart BBQ Sauce and Rub. And of course you can’t overlook his top-secret (I have been instructed that I am not allowed to publish it, it’s so secret!) recipe for making the perfect buttertart. 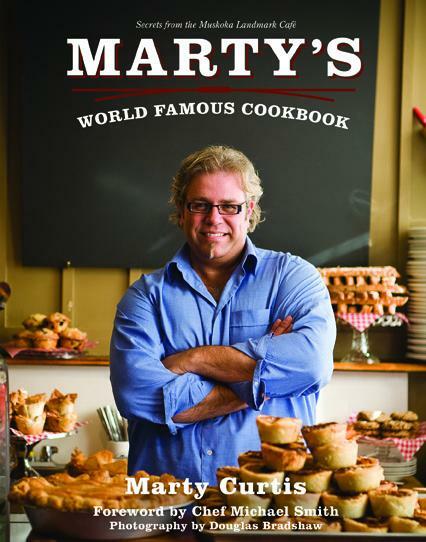 Marty weaves these amazing recipes along with the stories of whence they came and gorgeous photos of his food and the magnificent scenery in his vicinity.